Microdermabrasion is a non-surgical painless procedure which exfoliates the top layers of skin to reveal a smoother more even textured surface. It helps improve skin turnover and may also improve the skin’s elasticity and texture by stimulating the production of new collagen. Several topical products can be applied immediately after your treatment for additional benefits depending on your specific needs (acne, pigmentation, antiaging etc). Treatments may be done weekly, monthly or as determined by your customized treatment plan depending on your needs and expectations. A series of treatments are optimal and regular maintenance treatments along with a good daily skin care routine helps maximize skin health. These treatments can be used on all skin colors and types. It is not recommended if there are any open wounds or areas of significant inflammation. This is best determined during your consultation. Most treatments leave the skin with a mild pink “glow” which typically resolves shortly after the procedure (up to a few hours is normal). Most patients say they feel a slight vibration and/or tingling sensation during the treatment. We will properly prepare your skin for your treatment. If you are using any retinoid products, either prescribed by your medical provider, or over-the-counter, please discontinue them for 3-4 days before your treatment. Examples of retinoids include retinol, tretinoin, Retin-A, Atralin, Differin, Epiduo, Refissa, Renova, and Tazorac. 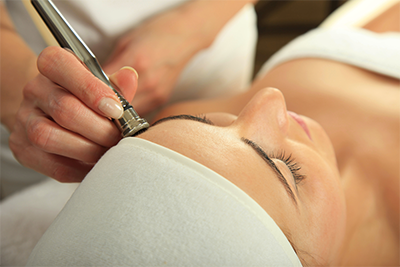 This is a procedure which combines microdermabrasion with a chemical peel. The initial microdermabrasion removes the top layer of skin cells allowing the chemical peel to penetrate into the deeper layers. This will intensify the effects of the peel but faster results will been seen. How do I care for my skin after my treatment?